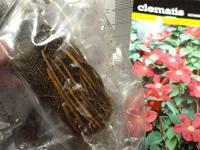 Clematis is often sold as a bare root plant. Spring may not quite be here yet, but the garden centers are starting to tempt us with those wonderful displays of bare root perennials and bulbs. I’m always drawn in by the gorgeous photos on the labels – all that promise, in what looks like just a bag of dirt! Bare root perennials are a budget-friendly way to get started on your spring planting, and with a little care they’ll deliver as promised. Here’s what you need to know about how to select, plant, and care for bare root perennials in your garden. Bare-root plants are dug from the field during late winter. The dormant roots are then shaken free of dirt and packaged in a damp, lightweight material (such as wood shavings). The plants are kept in cold storage until they’re moved to the garden center or shipped to your home from a mail order or online company. The idea is to plant bare root perennials in early spring while they’re still dormant, so they can naturally “wake up” in their new homes. Bare root perennials are cheaper than container-grown plants. Buy Fresh: Bare root plants need to be planted quickly. The longer they sit out in the store, the more they dry out, and the more likely they are to break dormancy and begin to sprout. Look for fresh shipments, or plants that are refrigerated. Inspect the Roots: The roots should be plump, firm and fairly light in color. They shouldn’t be mushy or blackened, nor should they be papery-feeling or dried out. A little fuzzy surface mold is OK, but don’t buy roots that look rotten. Look for nice, rounded, balanced clumps. A few small broken roots aren’t a problem, but reject any with large broken pieces or shriveled parts. Dormant Is Best: Fully dormant plants will do better than those that have already sprouted leaves. Sprouting plants can do fine, but they’ll need extra cold protection and will have the disadvantage of going into the ground stressed. 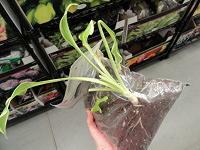 Buy Moist Plants: The package should be lightly moist, but not soaked and not completely dried out. Roots on bare root perennials should be healthy and firm. Plan for Planting: For best results, buy bare root perennials when you can plant them right away. They can be planted as soon as the soil can be worked in spring, but they need to be protected from heavy freezes, particularly if they’ve already sprouted. Ideal temperatures are between 45° and 60° F, though if the plants are dormant and hardy in your planting zone, they should be able to handle normal spring fluctuations. Temporary Storage: If you can’t plant right away, lightly mist the packing medium with water, and store the bags for up to 2-3 days in a cold (but not freezing) garage, or in the fridge. Soak Roots: If the roots on the bare root perennials have dried out, place them in a bucket of water to soak while you gather your supplies and dig the planting hole. Starting in Pots: Some people prefer to plant bare root perennials in pots, so that they can give them a couple of months of TLC before transplanting outdoors. With pots, you can get a few weeks head start on planting, by growing the plants in a greenhouse or bringing them indoors on cold nights. You can also protect them from late freezes and soaking spring rains. Use a well-draining container potting mix, and choose a pot that is a couple of inches larger than the root ball, so that the roots can spread out properly. Hosta plant has broken dormancy. Planting: When you’re ready to plant your bare root perennials outdoors, dig a hole about twice as wide and deep as the root ball. Backfill the hole to create a mound in the center. Place the root ball on the mound, spreading the smaller roots down around the sides. The crown of the root ball should be right at ground level, unless your planting instructions indicate otherwise. Gently press the soil firm around the plant. Water: Water bare root perennials thoroughly after planting to settle the soil, but overall keep the plants on the dry side until they start actively growing. Soggy, cold soil is deadly to new plants, and they won’t absorb much while dormant anyway. Mulch: Hold off on mulch until the plants start growing – you don’t want to over-insulate the roots or hold in too much moisture until they’re established. Label: Be sure to label your new perennials with plant stakes, so you can keep track of what’s growing! Fertilize: Wait to fertilize until the plants are about 6” tall and spring is in full swing. A balanced organic fertilizer or compost should do the trick. Pruning: As your plants grow, pinch back leggy stems to encourage branching. I planted bare rotted trees about 5 weeks ago, and can see no signed of life or leaves. Thank you for the information. Excellent! First time on this site. I have never planted bare roots before, but you article on this explained everything clearly and precisely. Thanks for the info.